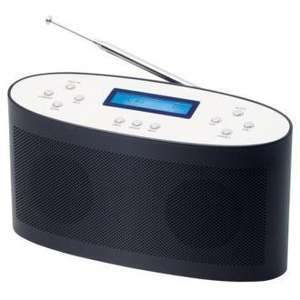 £20 for a Dab radio, got to be worth taking a punt on if your in the market for one. Looks like it would be at home in the kitchen....yeah in between the the toaster and the breadmaker....you can see it now can't you, got it in your minds eye. Buy it you know it makes sense. Added merchant, thanks for posting. I have had this radio for years, works great and wold buy again - was about £50 years ago, so £20 now is a good deal. Have ordered...thanks very much...heat added! Finally using the DAB bit of my kitchen radio. Radio 4Extra is a goldmine for classic Beeb radio comedy; Hancock's Half-Hour, Round The Horne, Take It From Here, etc. Bliss! Oh, this deal? Hot! Good radio, great price! Get it if you want DAB and its window to niche stations. looks a bit like this, perhaps its a bush in disguise? Voted hot, however I wish I could get any radio reception of any sort at home (analogue or digital) - live in a market town in Somerset. Only option for radio is Sky. Bush is just an Argos brand, they are made to order from companies in China and branded/boxed with whatever name Sainsburys/Argos want. The internals will be exactly the same. Why would you give your brand the name "Red" - talk about confusing. Would I be correct in thinking that this offer is not available instore? Ive had 2 Red DAB radios.1st packed in after 2 weeks, so changed for 2nd, and volume control doesnt work properly. In short, you get what you pay for, and it may be worth £19.99, but no more! Ive had 2 Red DAB radios.1st packed in after 2 weeks, so changed for 2nd, … Ive had 2 Red DAB radios.1st packed in after 2 weeks, so changed for 2nd, and volume control doesnt work properly. In short, you get what you pay for, and it may be worth £19.99, but no more! In stock today at Sainsburys Bath - a few still left. Know I know that its not gonna pump out a 1000 watts and sound like a Ministry Of Sound disco but it would have been nice for the speakers not to sound distorted when you have the volume on setting 4.. They sound very tinny as well bit no bass what so ever..
Ive had a complete refund and will wait for something with a little better sound to arrive..